Lernen Sie die wesentlichen Aromen und Techniken der thailändischen Küche in einem 6-stündigen Kurs in einer kleinen Gruppe in Chiang Mai mit einem erfahrenen lokalen Koch kennen. Besuchen Sie einen lokalen Markt, um die frischen Zutaten zu sehen, die die Basis jedes Gerichtes bilden, und stellen Sie dann an einer persönlichen Kochstation ein viergängiges Menü zusammen. Bereiten Sie Suppe, Salat, Pfannengerichte und Curry mit Tipps und Hilfe des Tauchlehrers zu und genießen Sie dann das Fest, das Sie zusammen mit einem süßen Thai-Dessert zubereitet haben. Gehen Sie mit Rezepten für Ihre Lieblingsgerichte auf und geben Sie Tipps, wie Sie sie in Ihrer Wohnküche nachstellen können. We learnt a lot about Thai cooking . We thoroughly enjoyed preparing and eating our exotic meals . This class is a must for all those that who love food and have passion for cooking. Amazing!!!! There were only 3 of use in the class, the max was four students. The instructor was a chef and really knew his stuff and was very patient with us. We took the class in his backyard which was beautiful. The market we went to was outside of Chiang Mai near his house and was the most clean and fresh smelling market we had visited in Thailand. we learned how to make 4 dishes, we were all very full at the end of the class. The recipe document that was sent to us later was amazing and very professional. It had about 20 different recipes including the 4 we made. I felt I could easily replicate these dishes at home. 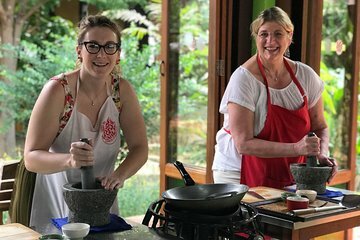 I would 100 recommend this class to anyone staying in Chiang Mai, I would also love to take a class with our instructor again with different dishes so I could learn more! We would definitely recommend this cooking class. We were very impressed with our instructor and how he showed us around the market and cooked such a delicious meal with us. The recipes were easy to follow, but we appreciated all of the help along the way. It is an intimate setting my fiance and I were the only people signed up that evening and we enjoyed the attention. I cannot say enough good things about the food as it was delicious, authentic, and something we could prepare back at home with the help of the emailed recipe guide! Our instructor was a wonderful dinner companion as he had great English and interesting knowledge about the area. It's always nice when you go somewhere new to learn about how people there actually live, so it was an eye-opening and stomach-filling experience. We look forward to trying to recreate our meals in our home soon.